When I saw this recipe (easy to make) I bought 2 packages of tofu just to try it. It’s delicious by itself but a dipping dish of soy sauce could work nicely too. Remove tofu from packaging, drain. Combine all the dried spices and Panko in a bowl and mix. (Not the egg). In a baking dish or other shallow dish add soy sauce and place tofu on top making sure all sides of tofu get soy sauce. 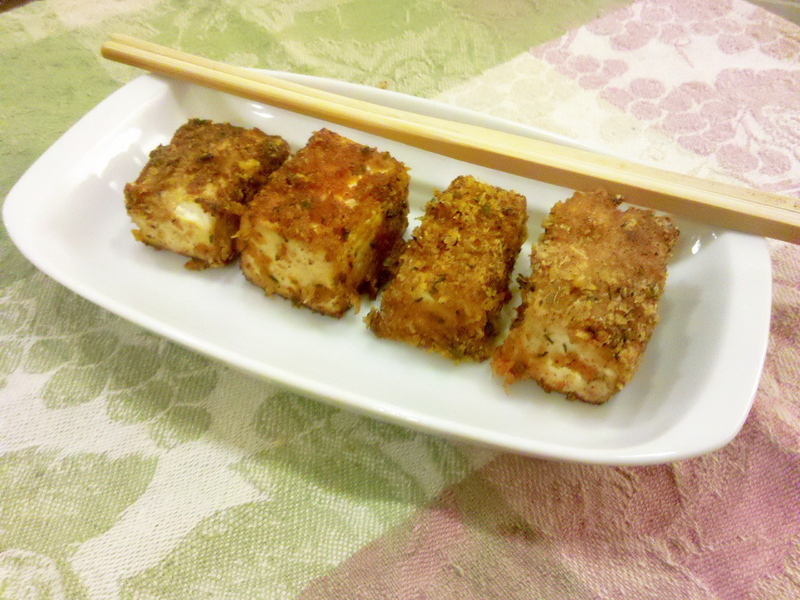 Dip each tofu piece in the egg batter, then coat with the spicy Panko mixture. Do this until all the pieces are coated. Heat sesame oil and cooking oil a large skillet to MEDIUM. Fry the tofu until all sides are a golden brown. This recipe was inspired by Be Happy Live Well. I will be trying this tofu recipe. Thanks Susan, please do. I hope you like it! I think next time I make I’ll try it with peanut sauce. Thank you for your comment P.K.! I think I’ll be making this recipe again soon. I like to use the low-sodium soy sauce from Trader Joe’s (Imported from Japan). It has a nicer flavor I think than the traditional “Chinese restaurant” soy sauce. That looks really good! Going to try it! Thank you, makes a great appetizer! Your strawberry crepe recipe looks like a great fix for my next breakfast. I can’t wait to try this recipe! I use Panko a lot when cooking for my boyfriend or parents, but since I don’t eat meat, I often don’t get to taste it. So I’m excited to try this recipe. Thank you for your comment! I think you’ll like this recipe. 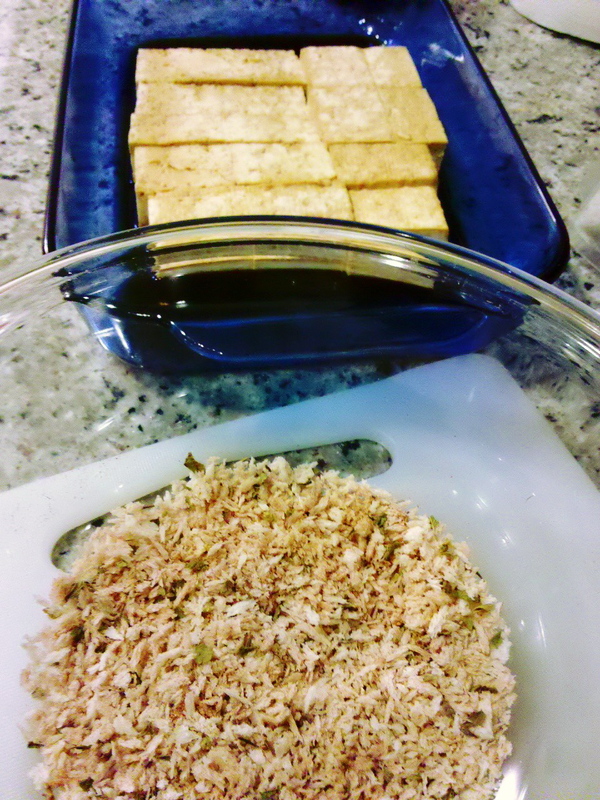 Tip: Coat all the tofu first then fry … less tedious and messy than one by one which is how I did mine. I just tried it tonight and it was tasty!! Thanks for a great recipe. Hi, I just saw your Blogalicious post. Thanks for the mention I’m glad it’s a good recipe! This sounds yummy! I have been experimenting a lot more with tofu. I like it crispy and recently tried a coconut version that was pretty good. I baked so maybe will try the skillet next time. Hi, thank you Melanie for your comment. Coconut sounds good too! Be warned: Frying battered tofu is rather tedious and very messy. Hi, thank you for your comment Melanie! Warning: Frying battered tofu can be tedious and is very messy.